Are you looking for a nicer and new vehicle? Whether it is a Nissan or a Ford, a Chevy or a Mercedes, a Dodge or a Chrysler a Jeep or a GMC....we have the vehicle for you! To help you start the year off right, we are offering our valued customers a great deal! With approved credit, you can drive away with as little as $19 down on your next vehicle! Worried about financing your new vehicle? We offer financing services where we work with numerous local lendors to help our customers not only get approved, but to get approved at a great rate! This helps streamline the car buying process to make everything as easy and stress free as possible for you! Here at AutoSense in Plover, we pride ourselves on making the car buying process one that is efficient for our customers and to offer the best customer service not only before, but after the sale! 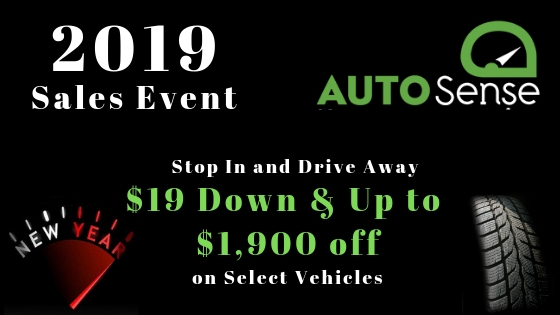 On top of this, we are also offering on select vehicles up to $1,900 off our already extremely competitively priced vehicles! With non-commissed salespeople and a no haggle pricing structure - we challenge you to find comparable vehicles at a better price! We work hard to ensure all of your needs and wants are met when choosing a vehicle and want to make sure you go home in a car or truck that is right for you - no matter what budget you are working within. You can also combine these offers with trading in your current vehicle. We are proud of our reptuation of providing some of the best trade in values. Ready to start the year off on the right tire? Stop in today and one of our team members will be happy to help you!